After the recent events in Nepal, the first instinct for some people is to jump on a plane and help out where ever needed. However, this can actually increase the problems in an area affect by a major disaster, because of lack of housing, food, and services. NPR prepared an excellent story that summarizes how best to help after a natural disaster You Want To Go To Nepal And Help Out. Is That A Good Idea? There is a multistage process to help communities. The first part is for local and international emergency services to assist the injured. A later phase where engineers can help is to rebuild the infrastructure that was lost, including roads to provide supplies and clean drinking water. What I learned from my experience with Engineers Without Borders-USA (EWB-USA) Orange County (OC) Professionals is that it takes a long time for communities to recover from a natural disaster. On the Honduras Project, communities were still recovering from a hurricane that had caused devastation to the country's infrastructure over 5 years prior to our visit. The building codes for the country were similar to code requirements in the US, but were not followed on most projects. According to a local civil engineer, our team designed and built a water tank that was only the second structure in Juticulpa, Olancho, Honduras to be designed for seismic. The other structure in Juticulpa designed for seismic was the hospital. The country of Honduras, like many other developing countries, is not prepared for another natural disaster. Civil Engineers can fill a great need in helping communities recover from a disaster, whether in a faraway country or in the US. To address this need, the OC Branch is building upon the success of the Younger Member Forum (YMF) with their local programs and EWB-USA with their international program to create a culture of community service in the Southern California Civil Engineering community. The intent is to partner with EWB-USA local professional chapters and other ASCE branches to build a large group of engineers who understand the long term needs of disadvantaged communities. We recently realized ASCE should provide different types of community service events/programs where our members can contribute to Orange County communities. Our members' time is valuable, so we need to make sure we provide opportunities that make the best use of their time. Members with children have great challenges in finding volunteer activities or community service events. This is why we have partnered with organizations like HomeAid to have one day events that our members can attend with their family. We understand there is a need amongst junior high and high school students to find community service events that they can include in their college applications. Hopefully this is a part of the ASCE OC Branch's Community Service program that we can grow over the next few years to allow members to be more active in ASCE and have more events that members can participate in with their children. For members who would like to be involved in large programs, the OC Branch has partnered with EWB-USA OC Professional Chapters on two programs. 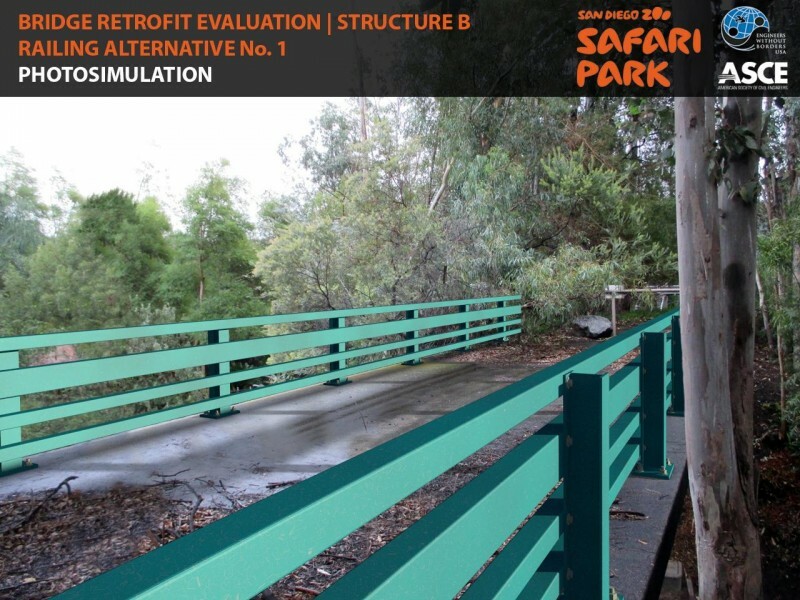 One program was discussed in my December 2014 article and consists of retrofitting bridges at the San Diego Zoo’s Safari Park to provide access for pedestrians and vehicles transporting disabled visitors. The Safari Park project is progressing and we are working with structural and geotechnical engineers to develop a preliminary design. A more recent opportunity has been with EWB-USA OC Professionals for a project the group is developing for Corazon. Corazon is an organization that builds homes in Tecate and Tijuana, Mexico. 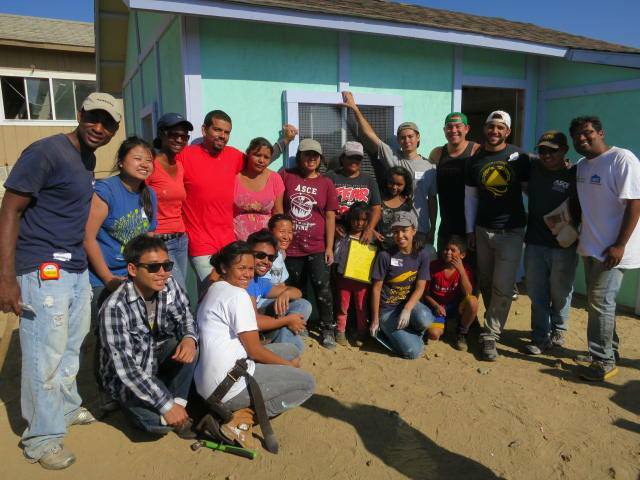 Corazon creates simple plans that allows a team of volunteers to build a home in a single day. Our past president Ziad Mazboudi wrote an excellent article with photos about his experience during one of the housing builds in August 2012. The OC YMF has been assisting Corazon for over 5 years. The constructed new homes are simple and do not include water, electricity, or sanitation. Recently, EWB-USA OC Professionals has been working with Corazon to develop a sanitation system that can be added to existing or new homes. The intent is to come up with simple plans so that non engineers could build the sanitation systems. ASCE OC Branch has agreed to partner with EWB-USA OC Professionals on developing the system and assist with funding to build three prototypes. The first prototype system has already been constructed and we plan to construct each system six months apart so we can learn from previous test projects. There are also opportunities for Civil Engineers to create simple energy and water systems to add to the health of the communities that Corazon is building. The last component of the OC Branch’s community service program is to support the EWB-USA OC Professionals international projects. EWB-USA OC Professional chapter has become very successful in raising funds for their international programs, but has struggled with finding Civil Engineers to help complete the designs. We hope that by having local community service projects, groups of ASCE members from different disciplines of Civil Engineering will be formed to periodically help on EWB-USA OC projects. The goal is to create large groups of each discipline so that demands on individual members are shared making these projects a true group effort and doesn’t impact other obligations. The OC Branch is excited to be working with members who have not been active in the past and partnering with other branches, YMFs, and EWB-USA professional chapters. We are slowly creating a framework of how we can get Civil Engineers experienced and excited to work on community service projects. It seems like the only time that Civil Engineers are on the news is when there is a failure or disaster. This program creates an opportunity to expose the public to Civil Engineering in a positive way. If you are interested in learning more about the community service program described in this article, please contact Greg Henk.